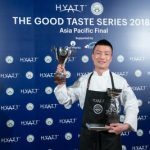 Hyatt Hotels & Resorts today announced that Sebong Oh and Lily Liu will represent its Asia Pacific region in The Good Taste Seriescompetition in the global final early next year. Now in its fifth edition, the annual contest has grown from a North American initiative to a global program featuring chefs from Hyatt hotels in Asia Pacific, the Americas, Europe, the Middle East and Africa. Designed to cultivate emerging talent from Hyatt’s kitchens, The Good Taste Series provides anyone from line cooks to executive sous chefs with an opportunity to showcase their culinary flair. “Hyatt has always enjoyed the reputation of being a leader in food and beverage. Our secret sauce to success is to foster a nurturing environment where we develop and recognize our chefs as well as provide a stimulating platform for them to exchange their knowledge and collaborate with one another,” said Andreas Stalder, Senior Vice President, Food and Beverage Operations and Product Development, Asia Pacific at Hyatt Hotels & Resorts. 340 chefs from 68 Hyatt hotels competed for the coveted opportunity to represent their sub-regions in this year’s Asia Pacific final of The Good Taste Series. Among which, six contestants were selected from across Greater China, Southeast Asia, Australia, Korea, Japan and Micronesia: Sotaro Okuda of Hyatt Regency Kyoto, Josephine Loke of Andaz Singapore, Sebong Oh of Grand Hyatt Seoul, Jason Ho of Grand Hyatt Taipei, Lily Liu of Park Hyatt Hangzhou and Woontae Baek of Hyatt Regency Perth. The night before the Asia Pacific final, the six chefs received a mystery black box containing wild venison, langoustine, porcini mushroom and kohlrabi that were to be incorporated into their dishes. In addition, they were provided with fruits and vegetables supplied by Ecofarm, a certified organic farm in Jiangxi, China. The chefs were then given a few hours to create a cold dish and a hot dish. The judging panel comprised of renowned chefs from Asia Pacific including Margarita Forés, Vicky Lau, Bruno Menard, Dave Pynt and Stefan Stiller as well as food critics Dong Keping, Susan Jung and Myffy Rigby. The judges also offered their expertise and provided guidance to the six finalists during the food tasting. Chef Sebong won top marks from the judges with his two creations: Steamed langoustine with yuzu sauce, fruit jelly, beetroot tuile, roasted porcini and broccoli puree; Bulgogi marinated venison, gochujang potato croquette, carrot-ginger puree, Korean braised kohlrabi, pickled asparagus and lime Yorkshire pudding. First runner-up, Chef Lily impressed the judges with her cold dish of langoustine, crustacean jelly, parsley mayonnaise and kohlrabi and a slow-cooked venison loin, rice mantle, porcini ravioli, oyster sauce with vegetable. 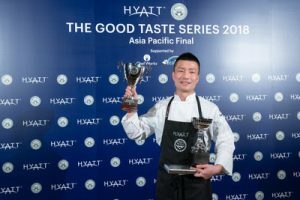 Sebong Oh and Lily Liu will face off with four other chefs from Hyatt hotels in the Americas, Europe, the Middle East and Africa in The Good Taste Series global final, which will be held in Singapore in the first quarter of 2019.